Much has been written about an advantage to clipped segmented kayaks is that the clips, being outside the hulll, allow each section to be completely watertight. 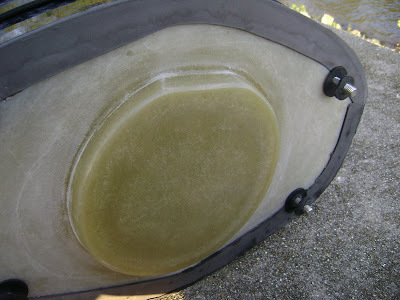 With a nut and bolt system, there are four areas of potential ingress of water through the bulkheads at the four bolts. This could be catastrophic in a long ocean crossing. Today, I went on a four hour paddle on a large inland lake, 20 mph winds, and chop that sent spray over the deck occasionally. I did not practice rescues or rolls today. At the end of the paddle I took apart the segments and, not only were the dry hatches dry, but I studied the male-female union. As pictured here, completely dry! So, although I do use rubber washers at each nut and bolt (the black rings around each threaded bolt in the photo), there was no wetness at all in the "joint" between the segments even at the hull, which was in the water completely for four hours. This is a testament to the strong seal. Valley, and perhaps other brands, use a thin, dense gray "foam" seal around the entire joint, as you see in the photo. It seems to work very well. For water to get past that seal, into the joint, past the two rubber washers (one on each side of the bulkhead; I have two in the photo because I took off the one from the other side of the bulkhead to show you--likely made it more confusing) and into the dry hatch seems improbable. I will watch the bulkheads for wetness as I roll and practice rescues and do longer paddles, but so far, very encouraging.